Recently we published a How To Guide For Recruiters on using social media for recruiting. The feedback we've had has been unbelievable (thank you!) and it's already been shared a staggering 1,464 times on social media. But one request that came through several times was for a shorter introductory post for those just wanting a brief overview of the topic. Well social recruiting certainly involves listening - so we've listened and here is that shorter introductory post! Here's a taster of what your business / recruiting team should be focusing on in each of these 7 areas. 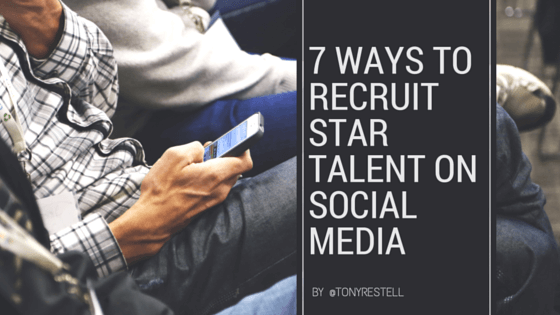 If you'd like the comprehensive run-down of social recruiting and these 7 ideas be sure to check out the full how to guide. Having a strong recruiting or employer brand on social media is important for two key reasons. Firstly, being a name that candidates know and respect improves the returns you get from every other recruiting activity you undertake. Candidates are more likely to take your calls, reply to InMails, respond to job adverts, etc. if yours is a brand they have already warmed to. But as well as improving the ROI of everything else your recruiting team does, a strong recruiting brand on social media can actually be a new means of attracting candidate interest in its own right. Think of your social media followers as your talent pool and your advocate network. A company that wins a large following for its recruiting team's social media profiles has a ready-made audience of potential candidates that can be enticed to submit their resumes in the future. It also increasingly has a network of people who believe in the business and who will become more and more willing to share your openings to reach their networks too. How to do this is something I cover in my regular free webinars on social recruiting but suffice it to say there are 4 steps that have to be adhered to if you want to get results. For most of our clients, this step will form part of their strategy to have a stronger recruiting brand presence on social media. But it's also an approach that can be used in isolation and so I've split it out here. The core idea to exploit is that there are already lots of people and organisations out there who have built sizeable engaged followings of the exact types of people your business would like to recruit. To give you a simple example, sales software vendors and sales trainers both will have sizeable followings of sales people. As a recruiting team, what you want to be doing is finding the influencers in your industry who also regularly reshare content and updates from other businesses. These are the people you want to build relationships with to quickly see the reach of your recruiting brand skyrocket on social media. Reaching 20 or 30 times as many people as you have followers is something that's eminently achieveable and that's why it's worth your time cultivating influencer relationships. Novices pump job alerts out across their Twitter streams or Facebook pages, not realising that this is simply making them look desperate - and harming their prospects of ever attracting a loyal and engaged following of prospective future hires. I mean think about it, who wants their social media streams clogged with a barrage of untargeted job adverts? Only the most desperate jobseekers in our experience! Pros realise that social media provides a means of defining the exact audience (passive and active candidates) that the business needs to reach - and then paying to have hiring campaigns displayed just to that highly targeted audience. Better still, you don't have to become an expert at using the various social media advertising platforms yourself. You can turn to the experts to run your PPC campaigns on social media for you. Whether you use one of the many social referral platforms out there, or go it alone with your own internal project, the upsides from engaging staff to provide referrals are threefold. Firstly, by tapping into the networks of all your existing staff you can potentially reach a lot of your target candidate audience, in a way that's more personal than simply advertising to that same audience. Secondly because candidates will receive an invitation to consider a vacancy from someone they know, the chances of the candidate looking at the message and clicking to check out the vacancy are greatly enhanced when compared with eg. a cold InMail from a recruiter that the candidate doesn't know. The likelihood of them warming to the company - and ultimately succeeding in the role - is also improved if they already know people in the organisation. Last but not least, paying existing staff - rather than external suppliers - to generate candidate leads clearly improves the remuneration of your staff, whilst bringing on board staff members that the team are more likely to bond with. So there's the added benefit that your own staff retention rates are likely to be strengthened and the pressure to actually make additional hires is relieved. Whilst mobile recruiting and social recruiting are in some ways distinct, they are also highly complementary. Once you consider that most social media users are accessing their social accounts from a mobile device, it should clearly follow that no attempts to secure candidate applications via social media can ever be successful unless the steps that candidates need to follow in order to apply have been mobile optimised! Sourcing candidates via social media is the area of social recruiting that I'm least expert in. We offer a candidate sourcing service here on Social-Hire, but I very much leave others to deliver on this service. That being said, I can certainly comment on the overall importance of this aspect of social recruiting - I'll just defer to others when it comes to the How To aspect of doing this yourself. Given how closely LinkedIn is associated with this aspect of Social Recruiting, it's quite possibly the element that you'll be most familiar with yourself. The principle is simple. Today there are vast "Resume databases" available to anyone who wants to start working as a recruiter, where only ten years ago they'd have been proprietary assets of a recruitment business. So the barriers to entry for an inhouse recruitment team to find and approach candidates directly have been massively reduced. Similarly the barriers to entry for someone leaving a recruitment business to go and set up their own competitor. How to effectively mine LinkedIn for talent, how to find tech candidates on GitHub when you find they've deserted LinkedIn, how to tap into the more sizeable profile databases that Facebook and Google+ provide, how to find the in-depth social profiles of candidates who've caught your interest on Twitter. All this and more is the realm of the social sourcing specialist. There are various tools you can use to find talent across social platforms: TalentBin (by Monster), Entelo, Open Web (from Dice), Connect6, 3Sourcing and lots of training courses you can attend to bolster your skills. Last but not least is the impact that all your social media activities can have on Candidate Experience. At multiple points during the research, application, interview and offer acceptance stages, it's now highly probable that your candidates will have interactions (or a lack of interactions) with your company and its staff that influence whether they ultimately go on to be hired by you. All these touch points contribute to the overall Candidate Experience that you offer - and therefore to the acceptance rates that your whole recruiting operation is able to achieve. Ignore at your peril! All the best in your Social Recruiting endeavours this year and beyond and I hope this summary of our How To Guide has been helpful. If you'd like to spend some time chatting through your social recruiting tactics with us, you're most welcome to book in a time for a call with one of our super friendly expert team. We're here to help!